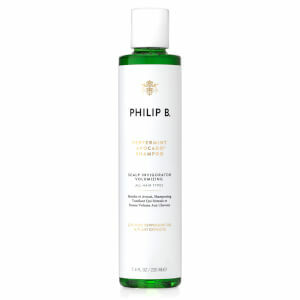 Refresh the hair and scalp with the African Shea Butter Gentle and Conditioning Shampoo from Philip B. Its mild cleansing formula gently removes excess oil, styling product residue and impurities from hair, whilst active botanical agents, including African shea butter, hops, nettle and comfrey deeply nourish strands, without weighing them down. 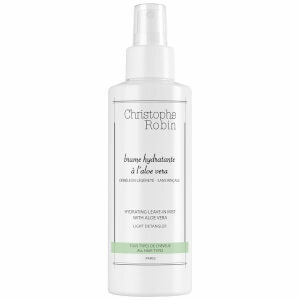 Developed to enhance shine and softness, the luxurious shampoo is infused with panthenol (vitamin B5) to restore elasticity and bounce for healthy-looking locks. Expect purified, radiant hair from root to tip. Suitable for daily use and colour or keratin-treated hair. E.N. Water (Aqua), Sodium Laureth Sulfate, Cocamide MIPA, Decyl Glucoside, Guar Hydroxypropyltrimonium Chloride, Citric Acid, Butyrospermum Parkii (Shea) Butter, Glycol Distearate, Panthenol, Propylene Glycol, Betula Alba Leaf Extract, Echinacea Purpurea Extract, Ginkgo Biloba Leaf Extract, Panax Ginseng Root Extract, Camellia Oleifera Leaf Extract, Dioscorea Villosa (Wild Yam) Root Extract, Vitis Vinifera (Grape) Seed Extract, Arctium Lappa Root Extract, Chamomilla Recutita (Matricaria) Flower Extract, Equisetum Arvense Extract, Frangula Alnus Bark Extract, Geranium Maculatum Extract, Juglans Nigra (Black Walnut) Leaf Extract, Larrea Divaricata Extract, Quassia Amara Wood Extract, Rosmarinus Officinalis (Rosemary) Leaf Extract, Symphytum Officinale Rhizome/Root Extract, Urtica Dioica (Nettle) Extract, Methylchloroisothiazolinone, Methylisothiazolinone. Wet hair; apply shampoo, lather, rinse. Repeat if desired.